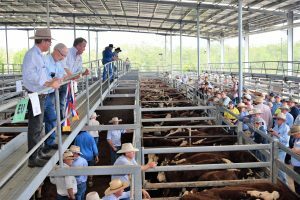 The annual Casino British Breeds Weaner Sale took place on Friday March 22 at the Northern Rivers Livestock Exchange (NRLX). 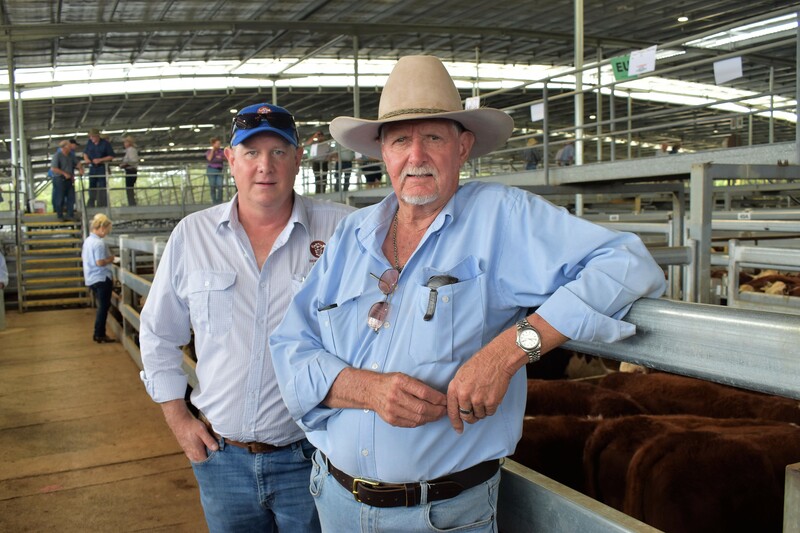 Selling agents George and Fuhrmann yarded 1500 steer and heifer weaners which were predominantly Herefords, but included a couple of hundred black baldies, Angus and Brangus. Buying strength on the day was attributed largely to backgrounders and repeat buyers from north western New South Wales and south east Queensland. Buyers included Elders Bathust, West Talgai feedlot, Ray White Warwick, Davidson Cameron and Co, Daryl Amos and Wickham Farm. 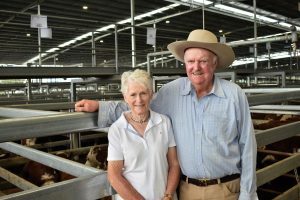 The top cents per kilogram priced pen of Hereford steers sold for $270c/kg and were offered by Jim and Jan Smith of Townview Pastoral. 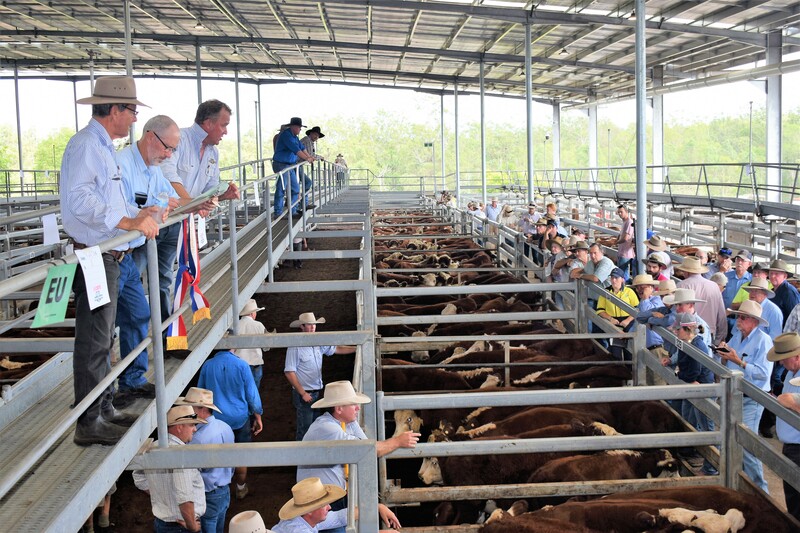 The 21 EU accredited steers averaged 301.4kg and sold to West Talgai feedlot, Allora, QLD. The top priced pen of black baldy steers also sold to West Talgai for 284c/kg. The pen of eight EU black baldy steers were offered by JS and V Smith and averaged 317.5kg. West Talgai buyer Kevin Flack purchased 101 steers averaging 320kg on the day for an average price of 268c/kg or $858 per head. The top price for Hereford heifers was 260c/kg and was reached twice by the opening two pens of heifers, both offered by Jim and Jan Smith of Townview Pastoral. The Townview heifers were also awarded champion pen of Hereford heifers at the sale. The champion pen of Hereford steers was offered by Mark and Kathy Cain and sold for 262c/kg. 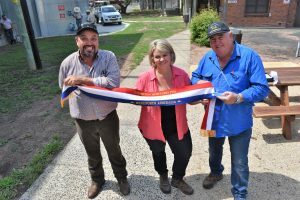 Mark and Cathy recently purchased their property in Kyogle and cattle (including the winning steers) from Warren Weaver, who continues to manage the property. The steers boast Yarram Park and Injemira bloodlines thanks to Mr Weaver’s previous AI program. Selling agent Darren Perkins quoted the top runs of steers at 245-268c/kg and the middle run at 220-245c/kg while the lighter cattle were around 200-205c/kg. Mr Perkins praised vendors for presenting their cattle in such good condition considering the widespread poor season, although weights were down on previous years. “Considering the circumstances of the seasonal conditions down here and everywhere, I think they (the cattle) were a great credit to the vendors, they’ve done a wonderful job in creating what they have. 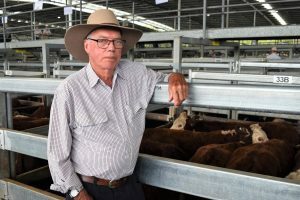 “The cattle aren’t as heavy as what they have been in previous years, we’ve probably got about 30-40kg less and that’s because of the dry start and the dry all the way through the season here.” Mr Perkins said. While a lot of the Hereford cattle offered at the sale were EU accredited, Mr Perkins estimated that only around 30 percent stayed within the EU system. Buyers such as Kevin Flack were sourcing cattle for domestic markets and therefore had no need to keep cattle within the EU system. “I’m not worried about EU accreditation because West Talgai feeds cattle for the Woolworths domestic market. 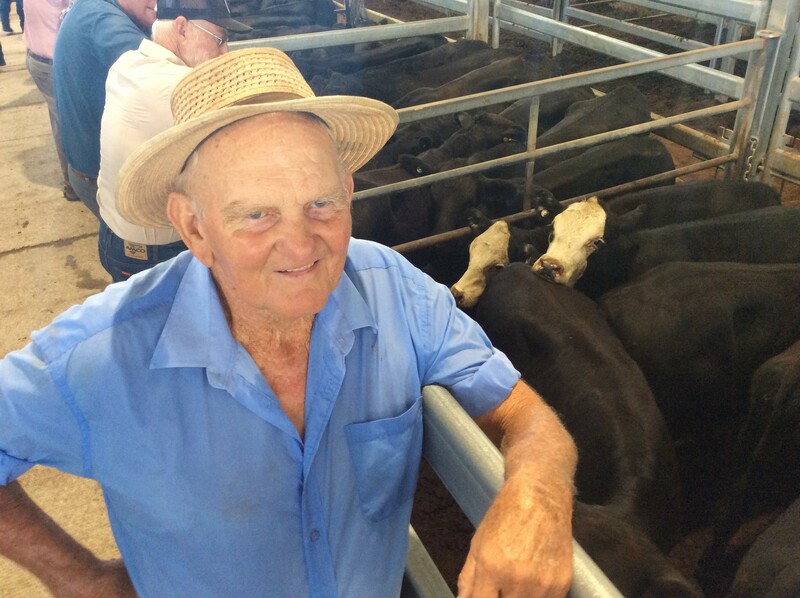 “I’m just trying to buy some good cattle that are worth the money.” Mr Flack said. Although many EU cattle left the system, Mr Perkins still deemed there to have been a premium paid for quality EU cattle. Heifers at the sale all sold to restockers who were looking for future Hereford breeders to join their herds. George and Shirley Hardcastle of McPherson Herefords sold all their 26 heifers at the sale to repeat buyer Daryl Amos. Mr Amos puts a Santa bull over the Hereford heifers and has been very pleased with the cross in the past. 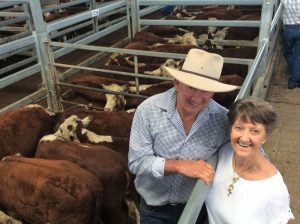 Mr and Mrs Hardcastle also sold 56 steers at the sale with their tops making 247c/kg and their middle runs making 242 and 245c/kg. Mrs Hardcastle deemed the sale to be “better than expected” although prices were down on last year. Herefords Australia Breed Development Manager Michael Beattie and West Talgai feedlot buyer Kevin Flack caught up before the sale. 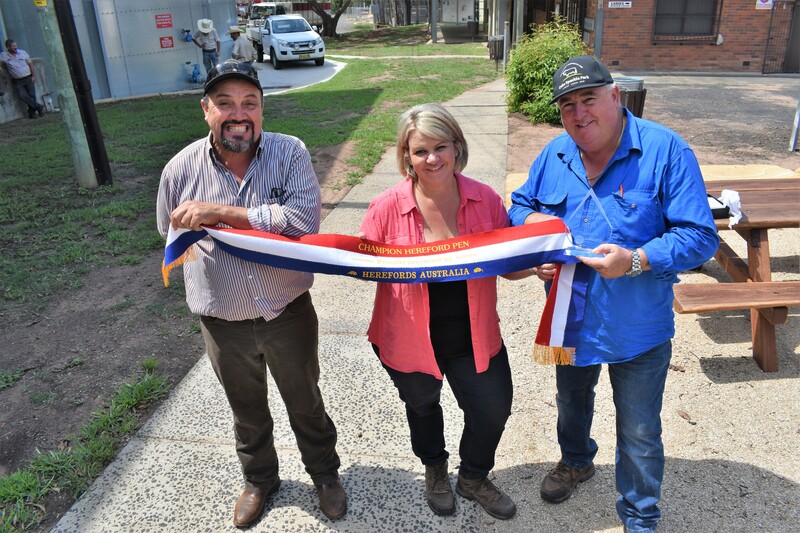 Kathy and Mark Cain with partner Laurence Stubbs (left) were awarded champion pen of Hereford steers at the Casino weaner sale with their pen of 8 EU Yarram Park and Injemira blood steers. The Cain’s pen of champion steers sold under the hammer for 262c/kg. 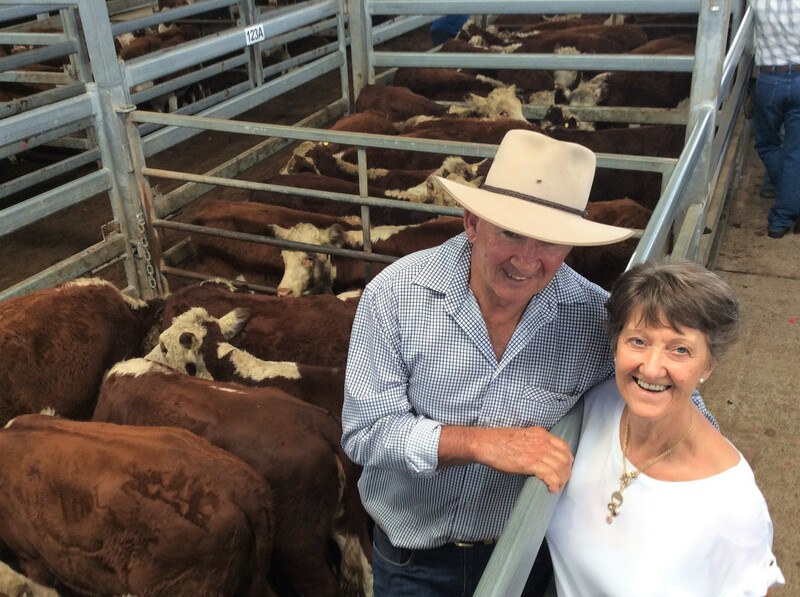 Shirley and George Hardcastle of McPherson Herefords sold 56 steers at the sale with their tops making 247c/kg. Jim Peterson sold his top steers for 238c/kg to Elders Bathurst.